According to legend, the science of spiritual liberation known as Alchemy was imparted to humanity as a gift from the gods who descended from the heavens around the time of Atlantis and Lemuria some thirteen thousand years ago. The knowledge then made its way through Sumeria now modern day Iraq, considered one of the birthplaces of civilization. The knowledge continues through India, Egypt, China, South America, Israel, Europe, and North America. This cosmic drama spans the length of recorded history up to the present day and addresses the deepest questions of life. This gift of spiritual technology is for the purpose of embodied liberation of the human soul where by ones evolutionary soul growth is accelerated to completion within one lifetime. The illusion of individual separation gives way to unity with the transcendent through the transformation of conscious awareness and liberation of the soul from the cycle of birth and death. The transmigration of the soul from incarnation to incarnation reaches completion and fulfillment. This is also known as illumination, enlightenment, transfiguration, ascension, or God realization. To the ancients, this science of transformation was the highest valued knowledge and the ultimate culmination of the human experience. The science was intact up until about three thousand years ago when the knowledge became fragmented and to a large degree lost. Suppression by orthodox religion forced the knowledge underground into mystery schools. It has also been referred to as the Perennial Philosophy or the Underground Stream of knowledge due to its hidden nature encoded in symbols, myth, and scripture. Although this sacred science of the soul is known by different names, it is known and misunderstood primarily by the name of alchemy. For most, alchemy has no definition. For some, alchemy has become a term in modern culture somehow relating to chemistry or is thought of as the attempt to change the metal lead into gold largely due to the influence of Hollywood. Transforming the lead of ignorance into the gold of enlightenment can be seen as a brief interpretation of this metaphor. The soul is defined as the divine spark of the infinite that manifests through the physical body. Alchemy, due to its inherent power, has always been a highly guarded secret science in order to protect the student from harm and to protect the sacred from misuse by the profane. During the middle ages, it was additionally hidden to protect one from persecution by orthodox religion. The hidden aspect of alchemy has contributed to the lack of definition and confusion. Alchemy continues to be shrouded in mystery, controversy, and speculation. It is the Arabians construct of the term that has remained in the English language. The Arabians originally acquired the science from Egypt. Before Egypt was invaded and re-named by the Romans, Egypt was originally known by its people as Khemit or the Land of Khem. They are also said to be the descendants from Atlantis before the great flood. The term Khem refers to the black fertile land from which the life giving crops grow. Esoterically, Khem refers to the dark mystery of the primordial first matter from which creation manifests and the science of transformation which is alchemy. The first matter is also equated with consciousness. Alchemy, is said to be the Great Work of nature that perfects matter, whether it is expressed as the cosmos or our soul. The term Chemistry has its root in Khem. The science of modern Chemistry evolved from the Alchemists in Europe. Alchemy was brought to Europe by the Moors in Spain originating from the Arabians. The Arabians added the prefix Al referring to Allah or God. Therefore, alchemy can be defined as the Science of God Realization. It has also been referred to as the Royal Art or the Royal Path back to God. Originally, the lineage of priests, priestesses, and royal dynasties were associated with being the custodians of this knowledge. Godfathers of alchemy were Shiva and Angiras of India, Anu of Sumeria, Thoth or Tehuti of Egypt, and the Eight Immortals of China. Thoth was known as Hermes by the Greeks and Mercury by the Romans. The Hermetic alchemical tradition stems from Hermes. It is the Hermetic tradition that took place in medieval Europe for some three hundred years. Additionally, some feel that alchemy evolved from the Shaman's of prehistory and is the result of the ancients living close to nature and unlocking her secrets. The gods were viewed as ambassadors from the heavenly realm with the mission of helping elevate humanity. With names like the Devas, Anunnaki, Neteru, and Elohim, they are collectively known as the Shining Ones. The idea that Man is a Deva is intriguing and immense. Its intriguing because much of the information about the idea is has been veiled with confusion and complications. And immense because it says much about humankind's place in the total cosmos. " The foundation of alchemical philosophy and practice is reflected in nature's elements and universal pattern of transformation. The four elements are Earth, Air, Fire, and Water. The seven phase pattern of transformation is comprised of Calcination, Dissolution, Separation, Conjunction, Fermentation, Distillation, and Coagulation. This is also known as the Emerald Formula. The elements are considered by the ancients to be the building blocks of manifest creation. The elements are not simply the physical elements, but are very broadly defined principles of nature. The Quintessence or Fifth Element corresponds to the Divine Essence or Essence of God. 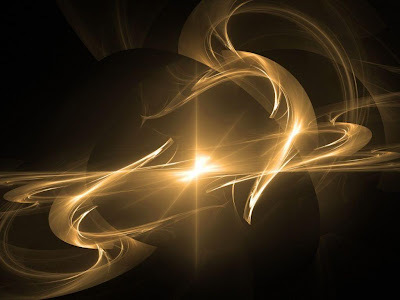 This divine essence or elixir was known as Soma, Rasa, or Amrita by the East Indians, Star Fire by the Sumerians, Ambrosia by the Greeks, Manna, Christos, or Living Water by the Hebrews, and The Philosophers Stone or Universal Medicine by the Europeans. The term Elixir stems from the Arabic Aliksir and Greek Xerion which means medicine. The elements make up the human body and mind. When one masters the five elements, one becomes an Adept, Siddha, or Perfected One. This is the transformation from mortal to immortal or human to godlike superhuman known as Apotheosis. Hermes or Mercury is known as the Messenger of the Gods and is a recurring archetype in history who restores the knowledge of Divine Union with the absolute. He is traditionally pictured holding the Caduceus Staff which symbolizes the alchemical process of spiritual liberation. The goddess Athena is the female counterpart of Mercury. What is striking when studying the various alchemical traditions from around the world and throughout history, is that they employ the same basic pattern of transformation mirrored in the Emerald Formula. Most notably, the Emerald Formula is reflected in the oldest known source book of knowledge, the Rig Veda of India. Rig means praise and Veda means knowledge. Soma researcher David Spess points out that all the aspects found in the Soma ceremony of the Rig Veda are found in the Emerald Formula. A primary key in understanding alchemy is to view the science from three perspectives. Internal referring to the body, mind, and consciousness. External referring to outside the body and of the Earth. Celestial or heavenly referring to the planets, stars, galaxy, and universe. Alchemy is a reflection of the phases, cycles, processes, or transformations of nature. Therefore, the symbolism of alchemy can be interpreted on a inner, earthly, and celestial level. Most importantly, the macrocosm of the outer world is mirrored in the microcosm of the human body, mind, and consciousness. The elements and pattern of transformation reflected in the Emerald Formula comes from the legendary Emerald Tablet attributed to Hermes. The Emerald Formula is said to contain the Secret of the Universe or Blueprint of Creation and was inscribed on a tablet made of emerald stone. It is reported the tablet was once on public display in ancient Egypt and thereafter became hidden. The Emerald Formula can be seen as having an integral correlation with the emerging science of Zero Point Energy or Free Energy technology. Some say the Emerald Formula is also mirrored in the symbolism of the Tarot that reflects the Royal Path back to God. The famous phrase "As Above So Below" comes from the Emerald Formula which is reproduced as follows. 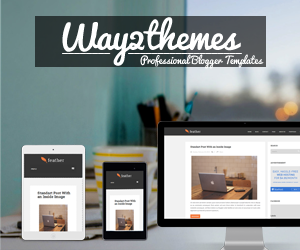 "In truth, without deceit, certain, and most veritable. That which is below corresponds to that which is above, and that which is above corresponds to that which is below, to accomplish the miracles of the one thing. And just as all things have come from this one thing, through the meditation of one mind, so do all created things originate from this one thing, through transformation. Its father is the sun; its mother the moon. The wind carries it in its belly; its nurse is the earth. It is the origin of all, the consecration of the universe; its inherent strength is perfected, if it is turned into earth. Separate the earth from fire, the subtle from the gross, gently and with great ingenuity. It rises from earth to heaven and descends again to earth, thereby combining within itself the powers of both the above and the below. Thus you will obtain the glory of the whole universe. All obscurity will be clear to you. This is the greatest force of all powers, because it overcomes every subtle thing and penetrates every solid thing. In this way was the universe created. From this comes many wondrous applications, because this is the pattern. Therefore am I called thrice greatest Hermes, having all three parts of the wisdom of the whole universe. Herein have I completely explained the operations of the sun." The great secret of alchemy is the Divine Marriage of opposites which gives birth to the Spirit Body of transcendence associated with liberation of the soul. 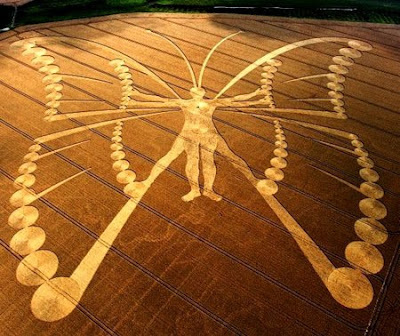 The exact process of metamorphosis leading to the creation and birth of the spirit body within the physical body has long been veiled in mystery and secrecy. The spirit body is not to be confused with ones subtle body or subtle bodies which one already has from birth. The creation and birth of the spirit body is a entirely unique process found within the various world traditions of alchemy. 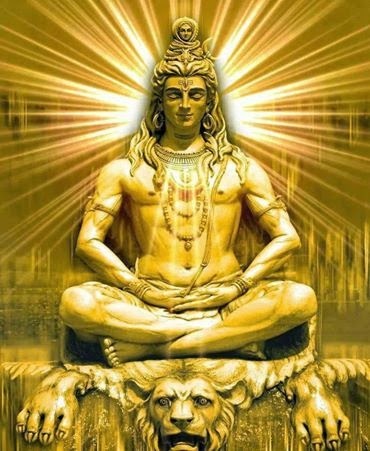 The spirit body has gone by names like Deva Deha, Siddha Deha, Golden Pearl, Merkaba, Rainbow Body, Diamond Body, Star Body, and Immortal Body of Light. You can find the most revealed aspects of this process in Chinese Taoist Alchemy and East Indian Tantric Alchemy. Traditionally, the process was taught from teacher to student in a step by step series of initiations. One did not progress until first mastering each successive step. The foundation for this process can be found in traditional Yoga comprised of physical postures, breathing, and mantra sound meditation. Yoga means union with the absolute. 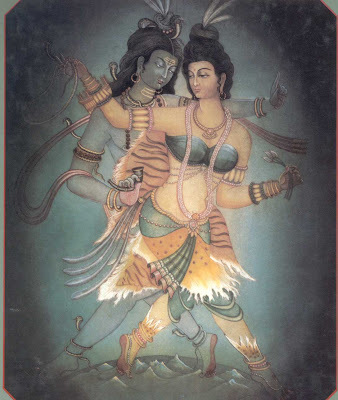 Depending upon the culture, the opposites were variously know as Fire and Water, Sun and Moon, Soul and Spirit, Male and Female, Mercury and Sulfur, King and Queen, Heaven and Earth, Shiva and Shakti, Kan and Li, Yin and Yang, Ka and Ba, Isis and Osiris, Soma and Agni. Also this marriage parallels the practice of Tantric sexual union and unfoldment of the inner life energy referred to as the Kundalini. 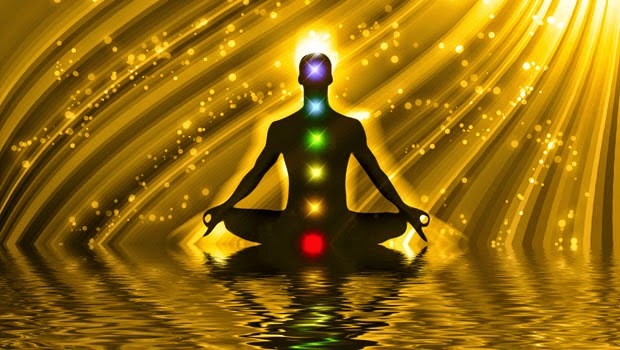 This process is also mirrored in the Jewish mystical tradition of the Kabbalah when ascending the Tree of Life which esoterically is the seven energy centers or chakras that run up the spinal column to the brain. The alchemical marriage of opposites can be seen in the symbolism of the intersecting triangles of the Jewish Star of David, Seal of Solomon, and the Sri Yantra of India. The upward pointing triangle symbolizes the male or fire principle, and the downward pointing triangle symbolizes the female or water principle. 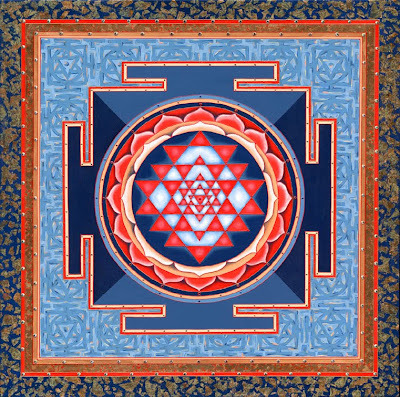 The Bindu point in the center of the Sri Yantra symbolizes the point of transcendence. The Yantra is a graphic symbol of the Mantra. The Mantra corresponds with the Five Elements and Logos or Word of God. Also the marriage of opposites can be seen in the symbolism of the Christian Cross. The ancient Caduceus symbol used by the modern medical establishment symbolizes on a esoteric level the alchemical process. The staff represents the spinal column which correlates with the Sushumna Nadi channel of yogic esoteric anatomy. The two ascending spirals of snakes represent the solar and lunar currents known as the ida and pingala of the kundalini life force. 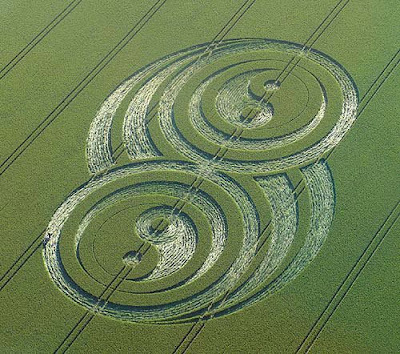 The spiral pattern is similar to the spirals of the human DNA. The symbolism of Jacobs Ladder or Stairway to Heaven corresponds with the Staff of Life. The sphere at the top of the staff represents the energy center of the brain or the seventh chakra also known as the thousand petaled lotus. The Wings at the top of the staff is the culmination of the alchemical process. 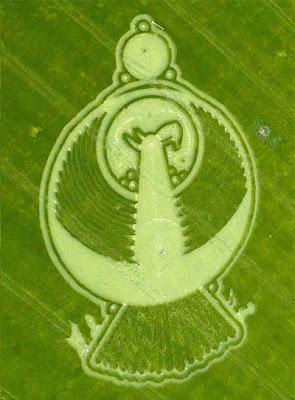 This represents freedom or liberation of the soul from the cycle of birth and death. One transcends the bonds of ego and bodily identification. The spirit is released from the confines of matter. Ultimately, this is the unfoldment of consciousness where by one realizes ones self to be infinite also known as self-realization. Most esoteric symbolism and myth reflects the process of alchemical transformation in both its inner and outer aspects. Dragon symbolism is a reflection of the life force. The Uraeus headdress of the Egyptian pharohs in which the serpent protrudes from the forehead symbolizes the unfoldment of the Kundalini. The Phoenix bird rising from the ashes represents the alchemical process of transformation, rebirth, and liberation. The Christmas Tree can be seen as a reflection of this process. Also the Biblical story of Adam and Eve in the Garden of Eden although edited by orthodoxy also represents the alchemical process. The Fruit of the Tree of Life can be equated with Elixir and Apotheosis. One of the most well know references to alchemy in the Bible is the passage attributed to Jesus in John 3, "I assure you, unless you are born again, you can never see the Kingdom of God. The truth is, no one can enter the Kingdom of God without being born of Water and the Spirit." From the esoteric perspective, this is the marriage of opposites. Spirit is synonymous with Fire and breath. The Kingdom of God is Apotheosis. The idea of rapture, resurrection, transfiguration, ascending to heaven, and becoming an immortal is based upon this process. There are numerous stories throughout history of those who practiced alchemy becoming immortal. This relates to the development and birth of the spirit body. This is the great spiritual rebirth, enlightenment, or illumination. Through the marriage of opposites, one becomes whole or holy, or to become born again. This can also be seen as the marriage of Soul and Spirit and an expression of the highest form of healing. It is the exact process of how to create this marriage which has always been secret. Gnosis or direct experience makes up the Gnostic tradition of Esoteric Christianity. Both Jesus and Mary Magdalene are considered to be key figures in the alchemical nature of Esoteric Christianity. The exoteric or outer rituals of orthodox religion like the Seven Holy Sacrament's, Baptism, Anointing, Christening, Consecration, Holy Water, and the Eucharist are a reflection of the esoteric or inner practice of alchemy where faith is replaced with direct experience, and death is replaced with embodied liberation. The anthropomorphic deity is transcended and the infinite is realized. The human body is the ultimate temple or alchemical laboratory where transformation takes place. The Spirit Body developed within the physical body is the ultimate vehicle of resurrection, ascension, and transcendence. It is said that to have a human body is a extremely rare gift and there are countless souls without a body waiting to take birth. Through the body and mind, one can realize ones true self. The focus of alchemy is to accelerate the growth of the human soul within one lifetime to completion or perfection. One overrides the process of normal evolution involving countless incarnations where the soul is led by desire and attachment to the temporal which keeps one bound to the cycle of birth and death. The experience of the phenomenal world and its associated pleasures do not give lasting happiness. Humans are programmed by nature to continually seek happiness which is essentially a search for ones true self. For most, happiness is sought outwards in temporal pleasure. Self-realization is about turning inwards and finding eternal happiness, peace, and fulfillment. The trials, tribulations, and lessons of life reach their culmination and fulfillment in self-realization. One transcends phenomenal creation and realizes the infinite source of creation within. With this awakening of awareness, one sees all of creation as an aspect of ones self. Alchemy accelerates the process of evolution thereby allowing one to step off the wheel of birth and death. One transcends desire, duality, karma, space, and time. Ones true nature is realized which is infinite. According to the ancient calendar, the complete knowledge of spiritual soul liberation is due to return. Some feel we have entered the time of the Apocalypse. The Greek term Apocalypse means "The Lifting of the Veil." This can be seen as lifting the veil on illusion to reveal that which is true. The age of Pisces is now fading and the age of Aquarius is now dawning. 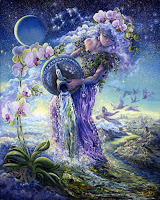 The symbol for Aquarius is the water bearer who pours out the alchemical elixir of transformation. Not only is this a change of the zodiacal age, but the beginning of an Ascending Cycle of evolution that only takes place once every thirteen thousand years according to the Vedic calendar. The Vedic calendar indicates we are in the Kali Yuga or Age of Darkness where humanity lives out of harmony with nature. This is where humanity is in the dark or unaware of our divine identity and where the material overshadows the spiritual. The Age of Aquarius is indicated to be a Golden Age of harmony and truth within the Kali Yuga. Additionally, the Mayan calendar ends in 2012. Some feel this correlates with the alignment of the earth with the center of the galaxy in which energy from the galactic center will bring unprecedented change and transformation to earth culminating around 2030. From the perspective of the Macrocosm and Microcosm, the galactic center can be seen as the cosmic heart, and the energy emanating from the galactic center reflects the macrocosmic kundalini that will lift the energy of the entire planet. Humanity has come far in the past one hundred years due to material technology, however this technology has also brought untold destruction to where the survival of humanity and the planet is at stake. The world with its numerous problems and having lost touch with its spiritual heritage is in urgent need of the rediscovery of spiritual technology. We have certainly reached a crucial turning point in history. It is said that it is darkest before the dawn with a conflict between the old and the new during this transition of ages. With numerous prophecies of destruction complete with Antichrist deception, humanity has the intelligence and freewill to alter such negative projections. Although the collective karma of the people is great, a return to the ways of nature is paramount for the restoration of balance. The rediscovery of the secrets of alchemy promise to bring forth a Spiritual Revolution. This would also bring forth a Energy Revolution since the knowledge relates to Free Energy technology. The discoveries that scientists are now making related to Quantum Physics and the Unified Field Theory correspond to the rediscovery of alchemy. Currently, the idea of enlightenment or spiritual soul liberation is not widely recognized or valued in modern culture where pursuit of the temporal and superficial overshadows fulfillment in the eternal. We shall see how the rediscovery of this vital knowledge manifests over the coming years. We have all incarnated at this momentous point in time to witness and participate in this grand cosmic drama. The choices we all make will lay the foundation for our future destiny that holds the promise for the birth of a whole new global culture based on spiritual values. Humanity stands at the threshold of making the leap from Homo Sapien to Homo Luminous. What an incredible time to be alive !